Super Paper Mario, Mario Strikers Charged, Punch-Out! 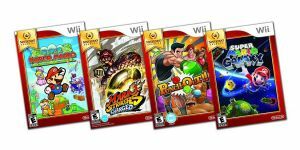 !, and Super Mario Galaxy are joining Mario Super Sluggers, The Legend of Zelda: Twilight Princess, Animal Crossing: City Folk, and Wii Sports as $20 Nintendo Selects titles starting August 28th. View the press release here.